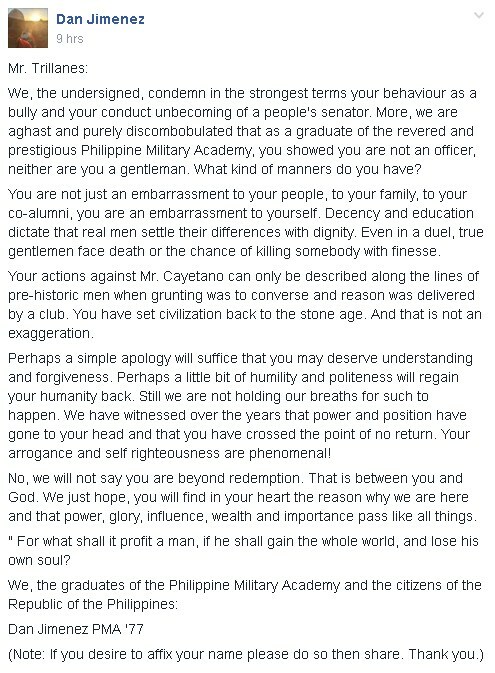 An open letter of Philippine Military Academy (PMA) alumni to their Bok Antonio Trillanes had gone viral last week. It came after the recent public inquiry of the Philippine Senate on drug-related killings in the country. 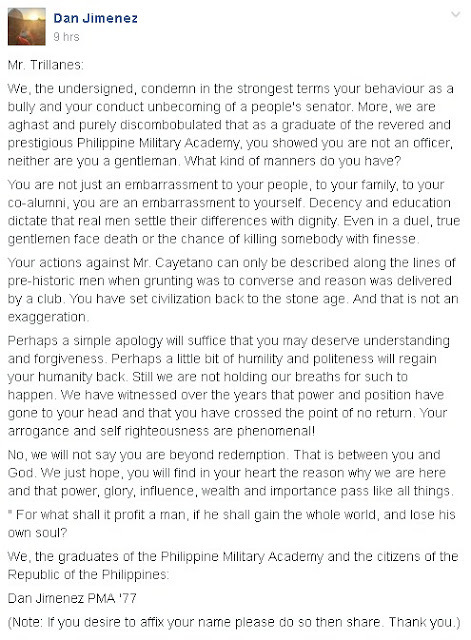 The open letter generally voiced out their disappointment to Trillanes' demeanor during the inquiry. Trillanes tried to kick co-senator Alan Peter Cayetano out of the session and even tried to prevent him from interpolating a witness by shutting off the latter's microphone. The entire spectacle was aired live on national TV and online. Netizens instantly voiced their reactions and condemnation on social media after witnessing the deplorable acts of the mutineer senator. 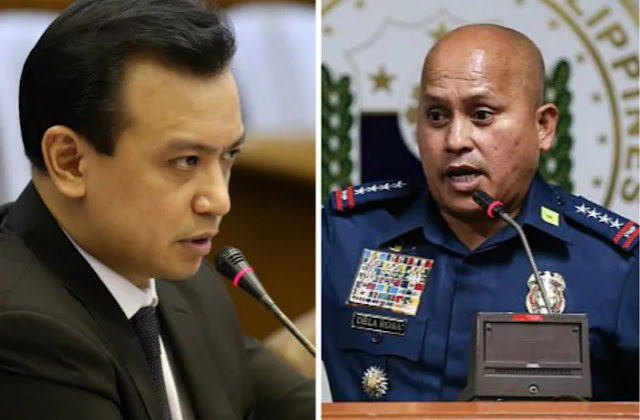 It can be recalled that Trillanes led two mutinees against the Arroyo administration, the Oakwood Mutiny in 2003 and The Manila Peninsula siege in 2007. Previously, the group also published an open letter in support for Police Chief General Ronald 'Bato' Dela Rosa for his efforts to eradicate crime, corruption and illegal drugs in the country. Bato and other high-ranking police officials have been undergoing scrutiny at the senate inquiry for several weeks now. 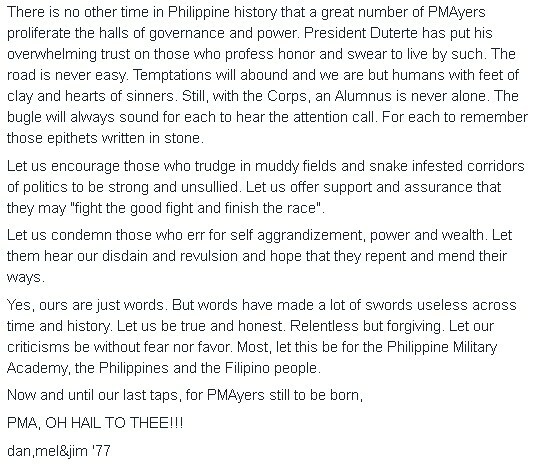 Dan Jimenez of PMA Batch '77, the original writer of the two letters, explained their merits. In a post on TheLongGrayLine, a Facebook group dedicated to PMA almuni and current cadets, Jimenez detailed the need to speak up. In less than a month, we have sent out two missives that have gone viral. One was for supporting Bato de la Rosa as the unwavering Chief, PNP in the war against drugs, the other was condemning Sonny Trillanes for his boorish behaviour in the EJK senate hearing. In both messages, the underlying impetus was our beloved alma mater, the Philippine Military Academy. In praising Bato and condemning Sonny, the utmost consideration was the continuance of the Academy's mission. Do her graduates adhere to what she imparted? Are they embodying Courage, Integrity and Loyalty? Many a time, the whole Alumni Corps was blamed for the infractions of a few. Many a time, each graduate was tainted with abuses, with corruption, with conduct unbecoming of a PMAyer because of those whose behaviour obliterated what we all hold dearly. We were all lumped in the despised basket of misfits, laughed at and ridiculed. We answered in humble protest and closed our ranks and cited the heroes who gave up everything in the service of the country and people. That, yes, PMA was not to blame. We did realize that words and strong rebuttals could only be as good as the actions that would back them up. That PMAyers must prove each and everyday that we are what we claim to be to the Filipino people. That we are worth the high pedestal they put us on. That their tax money was well spent in sending us to school. That they can emulate us and be proud. The post also cited how much regard and trust President Duterte gave to PMA graduates. The unprecedented number of 'PMAyers' currently holding posts in top level positions in the government confirms that. There is no other time in Philippine history that a great number of PMAyers proliferate the halls of governance and power. President Duterte has put his overwhelming trust on those who profess honor and swear to live by such. The road is never easy. Temptations will abound and we are but humans with feet of clay and hearts of sinners. Still, with the Corps, an Alumnus is never alone. The bugle will always sound for each to hear the attention call. For each to remember those epithets written in stone. Let us encourage those who trudge in muddy fields and snake infested corridors of politics to be strong and unsullied. Let us offer support and assurance that they may "fight the good fight and finish the race". Let us condemn those who err for self aggrandizement, power and wealth. Let them hear our disdain and revulsion and hope that they repent and mend their ways. Yes, ours are just words. But words have made a lot of swords useless across time and history. Let us be true and honest. Relentless but forgiving. Let our criticisms be without fear nor favor. Most, let this be for the Philippine Military Academy, the Philippines and the Filipino people. PMA, OH HAIL TO THEE!!! Below are the screenshots of the original post.